Polishing and drying media are also important process aids, which guarantee a consistent mass finishing process. 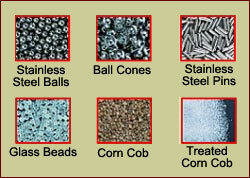 Stainless steel balls, ball cones or satellites, and stainless steel pins are used for burnishing and de-burring of ferrous and non-ferrous parts. Corn cob drying media is used in rotary dryers and drum dryers in which, parts can be dried without water spots, cleaned, or polished. Glass beads are also used for polishing. Adhesion prevention granules are used to prevent flat pieces from sticking together.